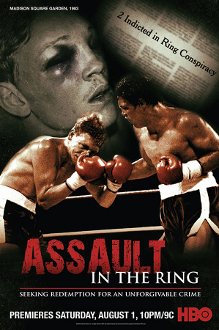 Assault In The Ring HD Blu-Ray. On June 16, 1983, in front of a capacity crowd of 25,000 at Madison Square Garden, the lives of two young men were forever changed during a controversial boxing match. A tough club fighter from Puerto Rico named Luis Resto fought Billy Collins Jr., an Irish golden boy, for ten grueling rounds. Resto was declared the winner, but within minutes, was accused of tampering with the padding in his gloves - in effect brutalizing Collins Jr. with his bare fists for thirty minutes. More than two decades later, Luis Resto is still a broken man shouldering the burden of his opponent's death; a prison sentence; and a lifetime ban from boxing. Resto relives that infamous night in New York City and exposes the sport's dark side - unfolding an emotional story which finally reveals the truth.